Today for first time I have tried the Rail link train from Suvarnabhumi Airport to thecity center. We have already covered this topic, however it is important to keep the information updated and add some new tips. The service is absolutely the best way to get from the airport but even more importantly it is the best way to get from Bangkok city center to Suvarnabhumi Airport, when people arrive in Bangkok there is not really any rush to get to the hotel, it is booked and it is there, it won't go away. So if traffic is jammed it will be just a waste of valuable holiday time but at the same time the opportunity to see real Bangkok form the car windows and take few pictures. The real problem is when people are trapped in the traffic on the way to the airport, the flight won't wait for you. Here the train between Bangkok and the airport is the best solution. Direct, no traffic jams, runs every hour, every half hour for some lines, from 6:00 am to midnight, it is comfortable and very easy to use. It arrives right inside the airport. It is safe and in case of any emergency the airport knows about it and can handle the situation. Once you have got your luggage to the exit look for the signs to Floor B (basement), follow the signs, also there are a lot of signs for the train link itself. Once arrived on floor B, after the coffee bar there is a huge area with the Thailand Railways logo, everything is automatic and easy, however it is better to check with the information counter which line is the best solution for you. Phaya Thai Express - for me the best, even if the most expensive, directly from the terminal to Phaya Thai Station. This station is part of Bangkok's mass transport system and is the connection point with BTS the sky train, so easily in few minutes by foot and escalator you will pass from the Rail Link system to the Sky Train system that has two lines and connects to Bangkok's main center. 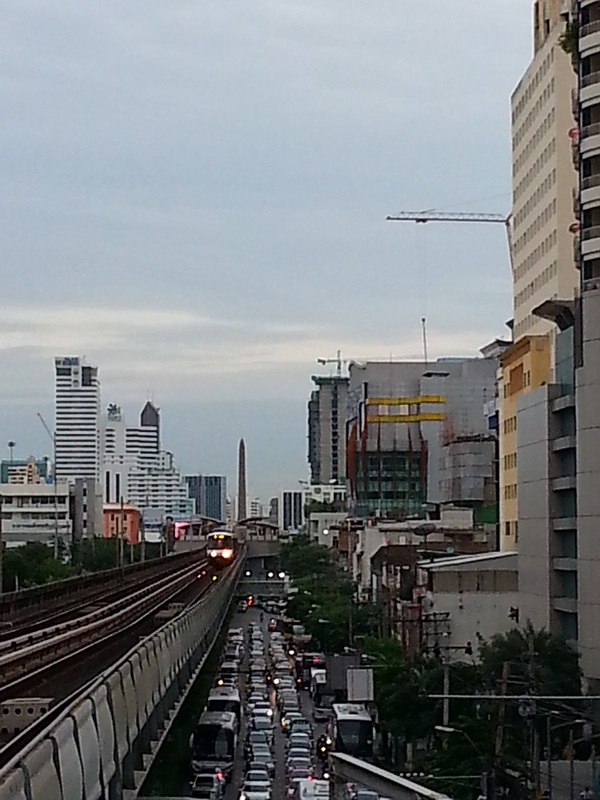 The station is very close to Siam Plaza that is also the exchange station between the two sky train lines. Makkasan Express -for those that stay in hotels in Sukumvith area or like to start their stay in Bangkok with shopping at the famous Pratunam (water gate) market, where you can find any kind of merchandise at incredibly cheap prices. It is a little over half the distance to Phaya thai, the express option skips all the other stops between Suvarnabhumi Airport and the Bangkok City Air Terminal (BCAT). That is what has been created at Makkasan Station, here you can also do flight check in. 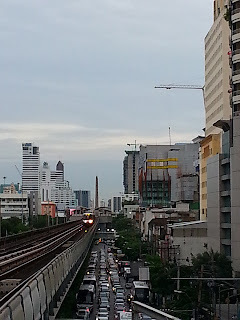 The station is the connection point with Bangkok Subway or MRTA, The subway runs more in a North/South direction while the Sky Train East/West. City Line - same kind of train, clean, modern, comfortable and with aircon. This service stops at eight stations on it's way, including the two above, really depends where your hotel is or if you have a specific destination. Also for those not in a rush, like to save the penny or as me that didn't understand which train to take and the automatic ticket machines only issue tickets for this service. The City Line Train is also very useful to move in a cheap and comfortable manner in Bangkok as it serves areas that are not covered by Subway or Sky Trains. This service is the Commuters favorite one, not only because it is cheap but because it stops in many areas. - Ramkhamhaeng - best for the Ramkhamhaeng University in Bangkok, largest open University in Thailand. - Ratchapraop - if you like shopping and like to see the huge wholesale market of Pratunam this is your station. - Phaya Thai - the terminal, from here you can go everywhere in Bangkok, so if you are not sure which station is better for your hotel. just get here and you will easily find the way to the hotel. To make your way to the airport the Rail Link is best solution, you will be sure about the time you will reach the airport with no doubts. No fears of getting trapped in Bangkok's infamous traffic, in a comfortable and relaxing way you will be inside the airport and at a cheap price. To get back to the airport I think best are the two express lines, less then 20 minutes, which gives you more time to spend seeing Bangkok. At every station there are automatic machines that sell tickets, simply insert the money (coins or banknotes) and the machine will return your change and token (a plastic coin). Next to the machine there is a map, this shows you a line with the station names, check which direction you have to take and look at the two digit number in the circle, that is the price to pay. Follow the easy instructions. Remember that tickets office are just there to change big bills into coins and to sell Express line tickets. Whichever train you take it is surely much better than taxis and traffic.